Below a little video commemorative of the event and a picture gallery that you can find as well at the local organizer website here. 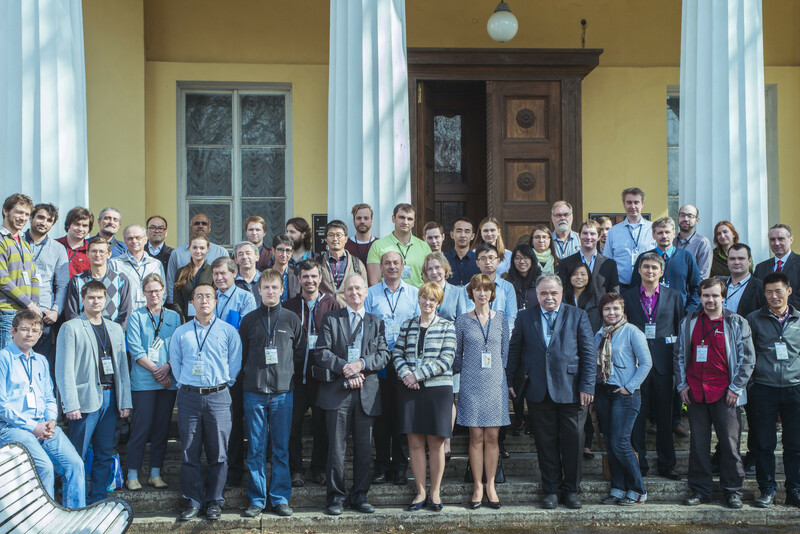 The 2017 AEROSPACE THEMATIC WORKSHOP on "Fundamentals of Aerodynamic Flow and Combustion Control by Plasmas" will take place during the week of April 9-14 2017 at Kochubei hotel, Pushkin, Saint Petersburg, Russia. This conference is the sixth of a cycle of conferences dedicated to the fundamental issues in the scientific disciplines relevant to aeronautics and space development. The conference is managed by a team from the Paris region, with Svetlana Starikovskaia (Chairperson, Laboratoire de Physique des Plasmas, Ecole Polytechnique), Christophe Laux (vice-Chair, CentraleSupélec), Jean-Pierre Taran (coordination, Onera). This time, local organisation is handled by Elena Kustova (Saint Petersburg State University). We encourage all lecturers and poster presenters to present their latest developments, even if they are still open to questions; note that the workshop does not prepare and distribute proceedings, to foster open communication and debate between all participants. The conference programme is now complete! Two versions are available, an overview and a complete program with the poster sessions. Below you find the overview. The congress complex is located in the historic district of the city of Pushkin, close to the Palace of Tsarskoye Selo. It lies in the former cottages of Vasily Petrovich Kochubey, master of ceremonies at the Imperial Court Tsar Nicholas II. The Kochubey mansion, which is currently the main building of the hotel complex, is well known in St. Petersburg for its architecture and well-preserved original historic halls, authentic and home furnishings. The mansion, with its main entrance, magnificent facades, interiors and luxurious historical layout, could be called a palace in miniature. Conference halls with their palace architecture and interior of the beginning of the XIX century have absolutely unique atmosphere. A visa will be necessary for non Russian residents. More details will provided in the coming days. They confer the participant 2-year membership to the Eucass association and reduced registration fee at the forthcoming Eucass congress to be held in MIlan 3-6 July 2017. For the registration, accommodation and other technical issues we recommend to visit the local organizers' web page at the following address: http://onlinereg.ru/ATW-2017.